Between Capricorn and Scorpio there is a special mutual understanding. 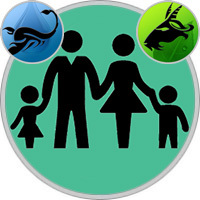 Scorpio-parent in the last resort will try to entice Capricorn because of defensive fortifications, because Scorpio hides sensitivity under external equanimity. Scorpio and Capricorn do not try to look different from they really are, but they like it when others consider them restrained. Even in his childhood, Capricorn prefers to show determination, discretion and independence, not doubts or vulnerability. He is able to convince others that he does not hurt at all. But Scorpio will guess the true feelings of Capricorn. Parent Scorpio pleases his little Capricorn. Scorpio is difficult to cope with naivete and childish pranks, but Capricorn is too reasonable to be naughty, and in addition, he is receptive to learning, and Scorpio adores the role of mentor. This mother wants her children to do everything well, and therefore sometimes uses the method of pressure. But there is nothing to worry about with Capricorn, and you do not need to press him: he already has an internal incentive to become the first. You just need to let him go his own way and do not rush: when the road is long, there’s nothing to hurry. This couple can be quite secretive, although Mom-Scorpio can not resist trying to get into the life of her child, trying to make him reveal his feelings. Well, Capricorn needs freedom and does not tolerate any encroachments on its "I". The house they will always be in order, because the Scorpio mom understands what her respecting tradition needs a small Capricorn. Scorpio will try to make sure that the child has everything he needs, especially a suitable school. Of course, there will be no problems here, especially if the mother tries to keep everything under control. Capricorn is quite stubborn and will not obey the commands without any explanation. He believes that he has enough responsibility to make his own decisions, and will not tolerate being manipulated. Mom-Scorpio must see to it that her child’s pride does not suffer in anything. Capricorn is not so confident in their abilities, as it may seem, and sometimes loses confidence. Well, without this you can not feel the reliability of your situation. These two are equally concerned with material well-being, social status, and Capricorn admires the mother’s ability to solve these issues perfectly. None of them likes change, and both are too serious to waste time on jokes and fun. Mom-Scorpio is happy that her Capricorn is naturally an obedient child, and one can rely on his common sense. Father Scorpio wants everything in his house to be as it is accepted, even if he is far from it. But his Capricorn feels secure and calm. True, the father must make sure that he pays enough attention to his child, because he so needs support and encouragement of his father. Scorpio is best not to give tough orders and generally restrain himself. Little Capricorn is more sensitive than it seems, and his trust can be shaken if he is not treated fairly. The child will simply close in himself, bury himself in the book and feel unhappy. Capricorn will feel if the father is too secretive. This will cause a feeling of anxiety and extra complexity, because all this is beyond his understanding. Father Scorpio should help the child to gain confidence in himself, by teaching him to cope with similar situations, but it is better if the little Capricorn is away from the incomprehensible life of his father. Scorpio really loves his child, he wants only good, he just is not always able to understand children or consider that his way of acting is not too suitable for Capricorn. This little person is better to create a favorable and cheerful atmosphere, so that it is not too serious and focused only on work. Father should help the child enjoy childhood, but at the same time respect his problems. His attitude to life and the love of the order is quite satisfactory to Scorpio. With this child, one should behave honestly, do not "pinch" with discipline, often praise - and he will be happy with his Scorpio father.